For those of you not in NYC who I tormented with the Rebecca Minkoff sample sale, fear not, I came out of the sample sale completely emptied handed. After work yesterday, a few friends and I stopped by to check out the sale I was dying for. There was no line, so we went right in. Upon arriving in the chaos, it was hard to find anything worth getting. I did see girls with several cute bags in their hands, but by the time we got there, the selection had been picked through to the point where there was nothing for us. I love Rebecca Minkoff, and I think that this sale has potential, but I would suggest to anyone going, to go in the morning. At least if you go then, the items are organized and they have restocked the inventory. Hey, I may even go back this weekend to see. Here are some pictures from the event! 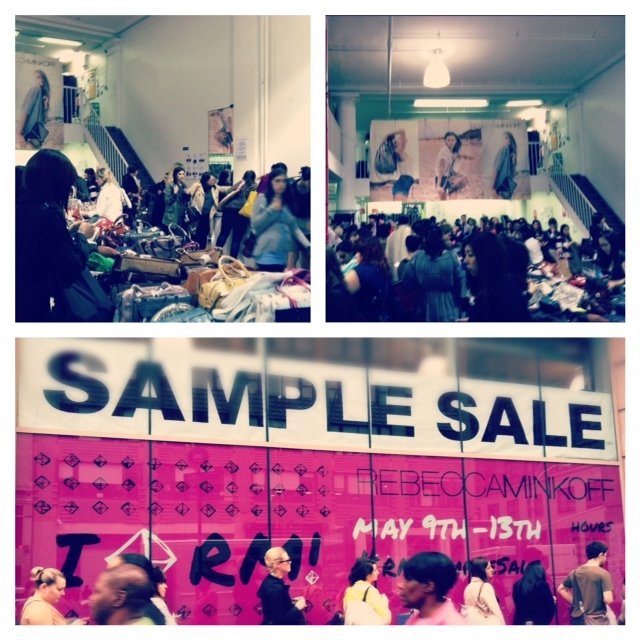 Have you been to any good sample sales lately? If so , which ones? Excellent Working Dear Friend Nice Information Share all over the world.olympic station cycles.God Bless You..